The Legal Tender Act of July 14, 1890 brought forth a spectacular issue of rare and desirable United States Currency: Treasury or Coin Notes. Ranging in denomination from $1 (a.k.a. “The Stanton Note”) to $1,000 (a.k.a the “The Grand Watermelon”) Treasury notes allowed bearers to exchange their notes for silver or gold coin. Whether the bearer received silver or gold coin was left to the discretion of the Treasury. Given the choice, our guess is most customers felt gypped unless they walked with gold in their pockets, but then again, it was the late 1890s and these were the days when a dollar was actually still worth a dollar. A nice stack of Morgan dollars is nothing to shake a stick at, so while these Treasury Notes were an odd lot, they were definitely a valuable tool for everyday folks to hedge their savings in precious metals. 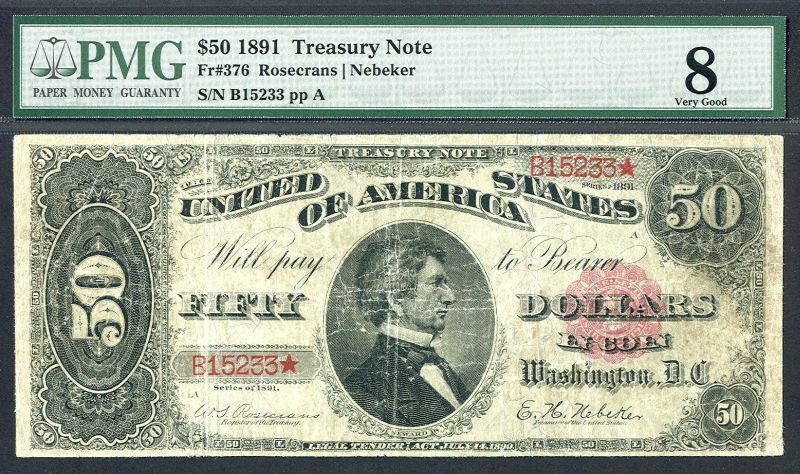 All Treasury or Coin Notes are considered rare, particularly in uncirculated condition or better. Naturally, there is a regular flow of $1, $2, $5, and even $10 notes that surface every now and again for collectors to buy. The higher denominations, however, are profoundly rarer, and usually take center stage at any major currency auction. Our feature note for today is Fr. 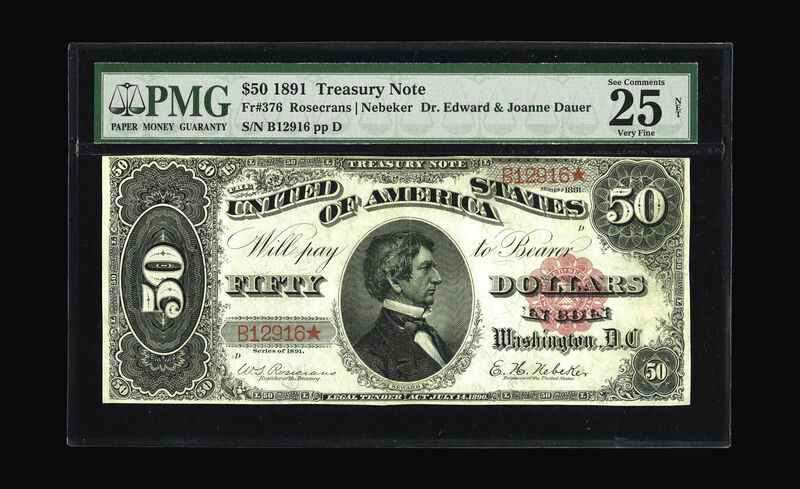 376, 1890 $50 Treasury or Coin Note, with signatures of Rosecrans-Nebeker. 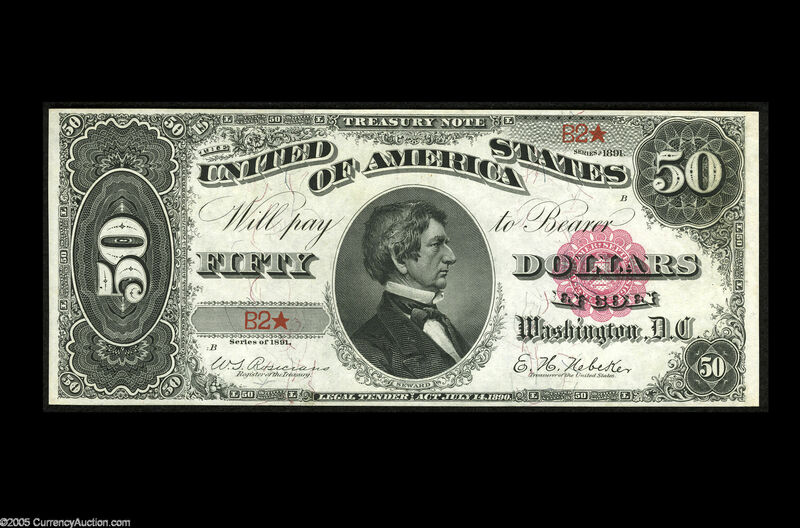 This particular note is also known as the “Seward Note”, because it features William H. Seward, the Secretary of State under Abraham Lincoln between 1860-1869. He also committed “Seward’s Folly”, the so-called Alaska Purchase from Russia. More than a century later, it’s clear Alaska is no folly at all, offering the continental USA an unparalleled amount of natural resources, strategic positioning, and the Palin Family ( 🙂 sorry just had to throw that one in there). This note is EXTREMELY RARE, with just under 25 examples known. We’ll chronicle a few of the better known examples below. If you happen upon one of these bad-boys in your Grandma’s shoe box, it’s time to trash that mid-sized car of yours that keeps breaking down and put a down payment on a tricked out Bentley. If Grandma’s note is well preserved, make that TWO Bentleys. The above is considered the BEST specimen of this note type seen in the last few years. It is unknown whether or not any other notes in private collections can meet or beat this note’s commanding PMG 65 Gem Unc. EPQ grade. At $299,000 this monster can definitely hold a candle to the PMG Gem Unc, but is slightly 🙂 more affordable – just enough that you’ll only have to sell your lake house to put a down payment on it. It’s unfortunate this example didn’t sell. Our guess is the reserve on the note was just out of reach of the crowd bidding on it. Still, it’s a great example of the $50 Treasury or Coin Note, with everything intact and solid in appearance. Although lackluster compared to the first two examples at PMG Very Fine 25 NET, this one is still worth collecting. It would probably sell for around $50,000 if it appeared at auction again. Out all the notes we’ve listed, this one is definitely within reach of most people. Even though the PMG VG 8 grade is not as desirable, it is still a great note to own all the same. Keep your eyes on this one: it might be coming to auction near you soon! We hope you’ve enjoyed our brief chronicle of Fr. 376. A parting thought: are there any undiscovered examples of this note still out there? Although we have no census data in front of us, our guess is YES, there must be! Trademarks, images, and any copyrighted language used in this blog entry are property of Heritage Auctions, LLC, Lyn Knight Currency Auctions, and CurrencyQuest.com. This article is written for news and entertainment purposes only. If you have interest in purchasing one of these notes, please refer to the auction house or currency dealer indicated in each note’s description for further information. We make all efforts to list accurate information. If something looks out of place, please kindly let us know. Thanks! How about a “date” with a National Bank Note? You Federal Reserve Note lovers have it easy: one date, a couple design variants, and usually nothing more. This style of “low maintenance” note classification appeals to many collectors who believe in the K.I.S.S. rule. If you’re more into “high maintenance” endeavors 🙂 you should definitely get a “date” with a National Bank Note – or, should I say a National Bank Note WITH a date! With 4 different charter periods and 10 different charter design variations, properly identifying an un-slabbed National Bank Note can be a daunting task. Don’t worry: we’ve done some research for you. Below, please enjoy our guide to dating and identifying National Bank Notes by charter and design type. When all else fails, we highly suggest visiting www.nbncensus.com. (The National Bank Note Census website – click here) which offers the most expansive database of National Bank Notes known. It was created out of information collected by National Bank Note legends like Don Kelly. First Charter – 1863 Original Series – The first National Bank Notes ever printed. These notes were printed exclusively by the Treasury department, unlike later issues which may have been printed at a specific National Bank. Their appearance is dramatic with intricate engraving and identification marks. In all but rare cases, these notes DID NOT bear their bank’s charter numbers on note obverses or reverses. First Charter – 1875 Series – This is the second issue of the First Charter. This issue included notes from newer banks that weren’t chartered until after the original series issue. Unlike their immediate predecessors, these notes DID bear their charter number on the obverse. 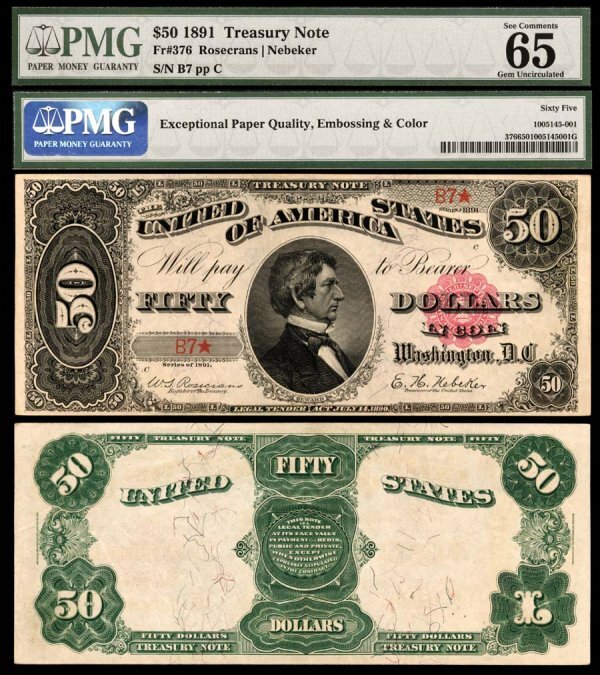 So, if you’re looking at multiple first charter notes and trying to figure out which notes are from the original series and which are not, look for a bold red charter number on the front of the note to identify it as an example from 1875. Otherwise, you have an Original Series note (*in ALL but rarest of circumstances). Second Charter – 1882 Series Brown Back – Brown backs were issued by new banks in the Second Charter period and by some surviving banks from the previous First Charter. Remember that the first issuance of notes in this charter period had NO date and NO denomination on the back. In terms of rarity, this type of Second Charter note falls in the middle between “Denomination Backs” (rarest) and “Date Backs” (more common). Second Charter – 1882 Date Back – As their label implies, these Brown Back notes had the dates “1882-1908” engraved on the back. These notes were the direct result of the Aldrich-Vreeland Act. At the time the notes were also known as “emergency money”. Second Charter – 1882 Denomination Back – Similar to the date back, except these notes replaced the date with the actual denomination of the note. These notes tend to be the rarest of the Second Charter period, as at their time of printing after 1916, various banks from previous issues had gone under. Therefore, this particular note type is generally rarer than its predecessors. Third Charter – 1902 Red Seals – The Red Seal third charter notes are among the most popular of all National Bank Notes. They were issued between 1902-1908, up until the passage of the Aldrich-Vreeland Act, at which point their production immediately stopped. Red Seals are scarce and usually valuable from any bank, save the largest banks that printed thousands of them. Third Charter – 1902 Blue Seals Date Back – This issuance of notes is very much similar to the date-back 1882 Brown Backs of the Second Charter period, and these notes were also known as “emergency money”. Unlike their close cousins, however, these notes bore the same appearance as the 1902 Red Seals, except they had blue seals on the front and the years “1902-1908” engraved on the back. These notes are generally more common than Third Charter Red Seals, although this can vary bank by bank. Third Charter – 1902 Blue Seals Plain Back – Notes from this issue of the Third Charter Period were the last Large Size National Bank Notes printed, with final runs concluding before the changeover to Small Size notes in 1929. Plain Back Blue Seals are the most common of all large size National Bank Notes and don’t command nearly as high premiums as Red Seals and Date Backs. Fourth Charter – 1929 Type 1 Notes – The fourth charter brought forth new banks and a complete redesign of National Bank Notes. Just as all other currency was reduced for the series of 1928, so were National Bank Notes for the series of 1929, their final series issue. Type 1 1929 National Bank Notes have two instances of their respective bank’s charters printed boldly on the front of each note – at the far middle left and far middle right. Fourth Charter – 1929 Type 2 Notes – Type 2 notes from the Fourth Charter Period nearly resembled Type 1 notes except for one minor detail: in addition to the charter numbers printed at middle left and middle right, charter numbers were also added next to the note’s serial numbers. For example, a 1929 Type 2 serial number might be A958298 115. The “115” at the tail end is not really part of the serial number even though it uses the same typeface and brown color as the actual serial number. It is just another way of identifying the issuing bank’s charter number. Compared to previous issues of National Bank Notes, 1929 notes appear rather drab and boring. The engraving of bank names was much simpler and more institutional in appearance, and designs resembled those of 1928 Federal Reserve Notes save the brown and black color used on the obverse. Be assured, though, there are plenty of rare 1929 notes to be found! We hope you’ve enjoyed our quick-and-dirty guide to identifying and dating National Bank Notes. If you choose to “go steady” with Nationals for a while, be prepared for all sorts of ups and downs. After all, variety IS the spice of the life, right?